What is "house dust" / indoor dust made of? "It's just dust, isn't it?" Indoor dust may not look as though it is made of anything very spectacular - and this is probably in some ways a good thing - because if most people knew what some of the ingredients were, they may well be horrified and become obsessed with getting rid of it! Indoor dust is composed of an incredible cocktail of ingredients - and its composition obviously varies depending on the contents of the indoor environment in question. Common house dust ingredients can include: Dead skin cells (human and animal), dust mites, dust mite excretions, mold / fungus spores, pollen, dead insect parts, wood dust, paper dust, dried urine, particles of metal, paint, plastic, hair, wool, soil, rock dust, soot, food waste... and chemical dust from the thousands of industrial products in our modern world. The smaller these particles, the easier it is for them to become airborne. The greatest constituent of dust in indoor human environments is usually dead skin cells - mostly of humans but also from pets. Although you may not have a visible dandruff problem, skin cells are dying and falling off your body all the time! It happens to all of us and is an essential part of having healthy skin. Dust found in homes also contains atmospheric dust - minute particles blown in from outdoors. Atmospheric dust can contain soil particles, pollution and particles from volcanic eruptions - and might possibly even contain small amounts of dust from outer space i.e. from comets. The vast majority of particles in the air is in the "ultrafine" range - that is to say, smaller than 0.1 of a micron or one ten-thousandth of a millimeter in size. Indoor dust is a known problem for hay fever and other allergy sufferers. Although dust has been around since time immemorial, in some ways the problem of domestic dust may have become worse in recent times, due to diverse factors. One such factor, ironically, is the draft-proofing of homes. Although this might help keep your heating or air conditioning bill down, the lack of ventilation also keeps dust and other airborne pollutants such as chemical sprays and VOCswithin the home. Another factor increasing the problem caused by dust is the increase in the number of manufactured products in our environment. Many of these create dust, which then adds to the "chemical soup" we are exposed to, and which may possibly cause serious health problems. See dust toxins page for more info. So, what can we do about dust? Well, first of all, don't panic. Ok, so you may possibly be breathing tiny particles of dead insects and your cat's dandruff, but remember that dust has been a part of our lives since humans began to live indoors! 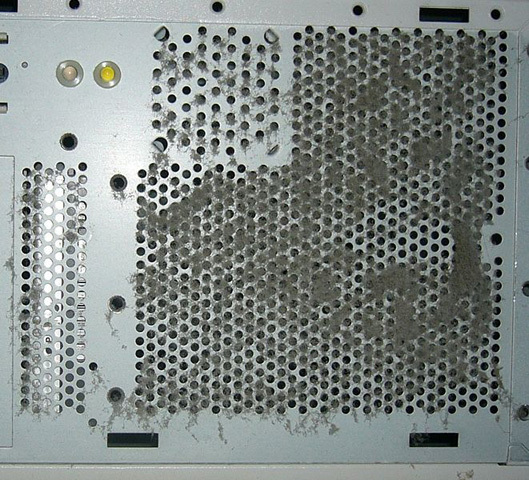 Dust that has collected around a computer air intake. Mmm, nice!